Will 2008 Be A Good Time To Buy Real Estate? When Was Life Harder - Then or Now? For me, the answer is "it depends." If I were previously considering buying real estate, e.g. a personal residence or a rental property, the answer for me would be "yes." If I wasn't in the market, the answer is "no." Renters - When mortgage, taxes and insurance are less then current rent. In the article, a renter reduced her monthly "rent" payment by $200 a month. This is a great deal if one can avoid moving for a few years. Craftsmen - If one has skills to rehab, can get a great price, and live in it while doing the work. Being able to do it oneself and live it in provides a good margin of safety. Investors - An experienced and successful real estate investor and have cash available. Having one's cost of goods decline is a great way to increase profits. Playing the Housing Slump - Time to Make Your Move? by Jonathan Clements in The Wall Street Journal offers another situation I would consider, i.e. helping one's children buy their first home. Finally, The Brighter Side of Housing by James R. Hagerty of The Wall Street Journal shares how people previously priced out of the housing market are now able to purchase homes that were previously "unaffordable." While it's tempting, I am not looking at the housing crisis as an opportunity to become a real estate investor, landlord or vacation home owner. At this time, I don't have the experience, time, or available money to do any of the three. 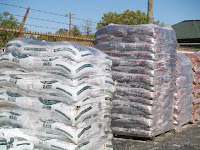 My wife found a great deal on bulk compost and mulch from our local waste management company, which recycles yard waste for our county. They charge $10 per cubic yard, with a minimum charge of $25. This is the cost for pick up at their location, and which includes loading. My pickup truck holds about 2 cubic yards and two truckload just about cover all the tree and flower beds in our yard. This compares to the 75 to 100 bags of mulch that I buy for about $4 each. We decided to use to compost this year to mulch our planter beds and trees. We were very satisfied with the quality of the compost, and will likely make the trip again in the fall. The only downside is the facility location is 10 miles farther than our local garden store. However, based on the savings and the quality, I think it's worth the trip. Finally, to note, the compost and mulch sales was not advertised. Also, relevant websites did not provide enough details and it took several phone calls to the county municipal waste office, a civic garden club, and the local waste management company to get the information. However, once I did find the right contact, the service has been excellent. ** On 3/7/2008, the system gave a sell signal for AAPL and GOOG. I currently plan to hold GOOG since it is part of my core holdings. However, if GOOG rallies into the low 700s, I will sell an equivalent number of shares purchased earlier at a lower cost, and effectively close out these positions. The market appears to have risen significantly from the near term bottom. As of the close on 4/25/08, the Dow, Nasdaq and S&P 500 indices were respectively down 2.10%, 8.65%, and 4.21% year to date, still up from lows of 9.37%, 16.58% and 11.86% in my 3/17/08 Stock Purchase Update. I continue to believe that the probability of a recession in 2008 is relatively high, if we are not already in one. The multitude of negative factors will eventually outweigh any actions by the government and financial institutions. Originally, the Fed interest rate cuts and other actions led me to expect that the bull market would last through summer, 2008. However, the economic data in early 2008 has caused the bull market to end earlier. For either case, I expect the market to continue to be choppy in 2008 with many short term rallies and declines. For now, I do not plan to add any more to the amounts that I have already invested in the above tables and may take some profits on long term gains at a 0% tax rate on Potash and Google when possible. I confess, I stopped using a calendar to schedule my life when I retired in my forties last year. I wanted freedom from a schedule. The upside has been having the flexibility to do fun activities with family and friends at a moments notice. However, the downside has been a reduction in project completion. For example, I have only done 50% of the fall/winter maintenance projects that I had planned. At this point, it's not clear to me whether my loss of time is due to: 1) Too many projects; 2) Inefficiencies in doing each project; 3) Sleeping 8-9 hours instead of 5 hours; or 4) Too many fun distractions. In any case, I think I need to begin using a slightly more rigorous project planning and calendar system. However, since I am retired, I will try to firmly schedule no more that 4 hours per day. I'd still like the majority of my time to be "free." I try this for a month and see if it is a reasonable compromise. Republican John Campbell has introduced the "Put Your Money Where Your Mouth Is Act" that would amend the tax code to allow for "contributions" above one's normal tax liability. In the future, Warren Buffett won't have to wait for his proposed higher tax rates, to pay more taxes. He can voluntarily do it. Win the Mega Millions or Powerball lottery. No one is ever surprised when a big lottery winner "retires." It seems winning a lot of money entitles one to retire, but saving a lot doesn't :-) The trouble is that counting on winning the lottery is A Very, Very Bad Retirement Plan. Dye my hair gray. To many people, gray is old, not gray is not old. My father didn't start becoming noticeably gray until his seventies. I guess I'll have to wait that long before people think I am old enough to retire. Seriously though, retiring early was a great opportunity for me and I'd do it again, even without winning the lottery, graying early or having a dream activity or interest to do. For example, my high school football coach routinely told us how we weren't as tough as his undefeated teams from a previous generation. To note, our team was in transition (2-7-1) in our coach's first year and would soon become pretty good. We would be 7-2-1 the following year and make the state finals in the two succeeding years, winning in our second attempt. One day, while we were practicing offensive plays, the coach told us that his teams used to put their hands behind their backs and fall on their face masks for a warm up drill. One of our lineman named H----- said, "That isn't so tough." The coach replied, " H-----, that isn't something you would do," and proceeded to show us the play again. Suddenly, we heard a thud. H----- had put his hands behind his back and fallen on his face mask. The coach looked at him with amazement and exclaimed, "That's the first time I've ever seen anybody do that." H----- had outbluffed our coach. The players all had a great laugh that day. Where does truth lie? For me, the answer is it depends on which aspect of life one considers. I think the older generations, generally, had harder physical challenges. When I was a child, our family did all of our daily tasks ourselves, e.g. child care, cleaning house, yard work, and cooking. In many cases, there were fewer appliances and services to help do the work. We didn't have microwaves, computers or cable TV we now take for granted. In other cases, we didn't have the financial means. For example, for many years, we were a one car family and only had one black and white TV. While shielded from many of the physical hardships, the current generation lives in a world that is much more complex and competitive, making life more challenging than for previous generations. When I played football, few of starters did weight training and we played other sports in the off season. Today, young athletes often work out year round, attend sports camps, and play on select teams to make the cut on their school teams. While doing well in school was important, the top students tended to take advanced courses based on interest, even if AP courses only gave a 4.0 for an A. Today, it seems that top students manage their high school curriculum to improve chances for admission to college. Finally, when I graduated, most college degrees enabled one to get a good job, and people could stay at one company for their entire career. While I can't predict the future exactly, I know my three year old will face an even faster changing and more complex environment than today, requiring her to make different choices and decisions. Our challenge, as parents, will be to provide her an education that prepares her find the opportunities no matter what future is. For more on Crossing Generations, check back every Saturday for a new segment. Last week's rally by Google showed how option buyers could make a lot of money on big move by a stock. On Friday, April 18, 2008, Google rose nearly 90 points on the strength of the earnings results provided on Thursday after the market close. For those who owned Google, this was great since the stock was down 35% year to date. However, one could have made significantly more by owning Google options that expired on April 18, 2008. On Thursday April 17, 2008, Google closed at 449.54 the April 510 calls closed at $0.60. One day later, Google closed at 539.41 and the same options last traded at $29.90, for a net gain of 4883%. In other words, $600 used to purchase 10 calls on April 17 would have been worth about $29,900 on April 18, excluding commissions. The investment required a significant gain in only one day. It clearly depended on whether Google had great results and it required at least a 60 point gain in order to be in the money. These were two big "ifs." Even for Google, 60 points was a very big gain. 90 points was the largest advance ever by Google. For perspective, I thought Google might advance 20-30 points on good results. Typically, out of the money options with one day to expiration become worthless. The 510s were far out of the money, by over 50 points. Buying such a option would be a long shot gamble, with a high probability of loss. On Thursday, I didn't think there was much chance Google would reach 500 on Friday. My track record of predicting daily fluctuations is not that good. If it was, I'd be day trading and I'm not. While I was hoping Google would meet expectations, I thought there was a reasonable chance of miss. Over the long term, I would likely have more misses than big returns like Google. To demonstrate my ability, or rather inability, to predict daily stock price, I'll do an evaluation of options for Apple and Amazon, which both report after the close today. Since I expect Amazon to beat estimates and Apple to meet expectations, I would consider the Amazon May 90 call for $2.04 and the Apple May 195 call for $1.90. At 11:00 AM today, Amazon and Apple are at $80.70 and $163.20, respectively. With this information, I will hypothetically buy one Amazon May 90 call. I will not buy the Apple May 195 call since the stock has not made a 32 point move during a month in the past. I'll report back after the close on how well my hypothetical position performs. Disclosure: I own shares of Amazon and Apple. I do not own any options for these stocks. This is not financial of investment advice. Please consult a professional advisor. The median salary ranges were between $55,600 and $98,700 and growth for these jobs was in the 4 to 34 percent range. When considering an area of study, it's probably worth reviewing the majors cited in the article that can help one be considered for these jobs. ** On 3/7/2008, the system gave a sell signal for AAPL and GOOG. I will try to sell AAPL in an upcoming rally. I currently plan to hold GOOG since it is part of my core holdings. However, if GOOG rallies into the low 700s, I will sell an equivalent number of shares purchased earlier at a lower cost, and effectively close out these positions. The market appears to have risen significantly from the near term bottom. As of the close on 4/18/08, the Dow, Nasdaq and S&P 500 indices were respectively down 2.42%, 9.40%, and 5.51% year to date, still up from lows of 9.37%, 16.58% and 11.86% in my 3/17/08 Stock Purchase Update. I continue to believe that the probability of a recession in 2008 is relatively high, if we are not already in one. The multitude of negative factors will eventually outweigh any actions by the government and financial institutions. Originally, the Fed interest rate cuts and other actions led me to expect that the bull market would last through summer, 2008. However, the economic data in early 2008 has caused the bull market to end earlier. For either case, I expect the market to continue to be choppy in 2008 with many short term rallies and declines. At this time, I plan to sell AAPL into this rally and continue to hold the balance of the portfolio. For now, I do not plan to add any more to the amounts that I have already invested in the above tables. What a week in the stock market! Last week Intel, IBM and Google met or exceeded consensus analyst estimates. The market rose significantly on these results, with IBM hitting a new high and Google gaining almost 90 points. Of note, these results plus other earnings reports (e.g. Coca-Cola, Caterpillar, and Honeywell) provided a markedly different global business/economic perspective than the disappointing miss by General Electric last Friday, i.e. non-financial companies with a major presence in international markets are likely to do well. Yahoo! - Hmm... I haven't thought about Yahoo! much. Like Ebay, I think Yahoo! is no longer relevant to the future of tech. I think Yahoo! will either meet expectations and disappoint via future guidance, or miss expectations. Amazon - I expect Amazon.com to exceed expectations. Companies that reported good earnings results last week partly credited growing international sales. Amazon's international sales account for 46% of revenue and are growing. They currently have the lead on cloud computing, based on their experience in managing retail sales. Any good news on this front will also be positive. Apple - As usual, Apple provided a conservative outlook in January, 2008, slightly below consensus estimates. The stock price declined significantly after that report. I expect Apple to meet expectations, and continue to provide conservative forward guidance. There is a reasonable chance Apple will beat consensus estimate, due to international markets, which account for 45% of its sales. Thus, any overseas growth in sales will be a help. Microsoft - My guess is that they will meet estimates, but like Yahoo!, I don't think Microsoft is a barometer for the tech sector any longer. Most of Microsoft's revenue is from Windows and Office upgrades and not from new innovations or the Internet. A merger with Yahoo! wouldn't change my future assessment of the company. In our household, we call the company "Microdog." Just check out its performance since 2000 to understand why. Overall, I look to Amazon.com and Apple earnings results to determine trend the market this week. Since I expect Amazon to beat and Apple to meet estimates, I believe the stock market will continue to rally this week. Disclosure: I own shares of Amazon.com, Apple and General Electric. The stock market action of this week has been very encouraging. The Dow, Nasdaq, and S&P 500 were up 4.3%, 4.92% and 4.33% respectively. Google was up 19% on Friday. Earnings announcements by Caterpillar and Honeywell indicate that General Electric's miss may be the exception versus the rule. Short covering probably contributed to the rally. There are still a lot of bearish traders shorting stocks. They were caught off guard by the upward move this week and probably needed to cover short positions to minimize losses. This has created short term additional buying volume, driving the market up, but not in a sustainable way. There hasn't been capitulation. In 2002, I remember it was extremely painful to be invested in the stock market, so painful that I sold most of our investments by the end of the year. I haven't seen this level of dissatisfaction yet in 2008. In casual conversations today, people were unhappy with 8% losses in 401Ks, but are not yet turning away from stocks. The impact of lower consumer spending still hasn't been fully reflected in the economy. I believe that reduced consumer spending is still trickling through the economy, which will result in more poor earnings results in the second quarter. While the stimulus rebates may mitigate the effect, I believe that the rebate payments won't eliminate the trickle down impact of reduced spending. Nevertheless, I appreciate the rally and hope to take advantage of it. A bear market rally should allow me to sell my remaining positions which have a sell signal. During this rally, I will also take some profits in my managed accounts and maintain only a minimum target level of investment in stocks. For my own accounts, I may sell up to 1/2 of profitable holdings to hedge against market downturn. Thus, when the market declines again, our exposure will be reduced. However, if I am wrong and the market continues a bull advance, we will not miss out on the gains completely. Disclosure: I own Google and General Electric. Taking early retirement in my forties has been great. I have no regrets. Life has been busy, more fun and less stressful. However, as with any change, retirement is not without its transitions. Here are some of the ones I've experienced, which I did not expect. Integrating into daytime home life. When I was working, I would leave at 7 AM and return home at 7 PM, five days a week. Sometimes, I would spend part of the weekend at work. Now I spend much more time at home and realize that I am not part of the routine that my spouse and child have developed for the time I was at work. At first, I tried to blend in and tag along, but that tended to interrupt the routines and wasn't helpful. Next, I tried to take on a part of the routine, such as taking my daughter to pre-school. Once the novelty wore off, my daughter preferred returning to having my spouse take her to school. What has worked is to create new routines, rather than change the existing routines. So part of my routine is to work on my own on our investment strategies and implementation. In addition, I now have my set of special activities with my daughter, from building with blocks, reading stories and looking a digital pictures from her first three years. Also, I join some new routine activities and can participate in non-routine daytime activities, e.g school play. Not being defined by my job. Since I used to work for a large company in our region, I was partly defined by my company, my title and my work. I am no long that person. Right now, I believe people still think of me as "the guy looking for a job" or "too young to retire." Acquaintances and colleagues still ask about what I am doing next, expecting me to announce that I am actively looking for or taking a job with another company. I think it will take at least a year before people see me as the early retiree. Enjoying simple pleasures. I am amazed at how much I had lost touch with simple pleasures, such as hot baths, sleeping 8 hours, and playing with our child. The best part is I no longer have to "schedule" these activities into my day. I expect that my simple pleasures list will continue to expand with time. The transition I did expect was to work out my goals and plans this phase of my life. However, I expect this will take some time as I think about things like my dream job. At this point, I am still enjoying the break from work and plan to spend more time on goals in the second half of 2008. Recently, I wrote an article on how to Become A Millionaire, based on saving $158.15 monthly for 40 years. Not too long afterwards, Yahoo Finance! published The One Year Million Dollar Challenge and offers an alternate approach, one payment of $20,500 and wait 41 years. Both approaches assume a 10% annual return on the savings. Here's one way I might combine a periodic and single amount contribution to help our our three year old daughter become a millionaire. Start working at age 16. Optimally, it would be working for a future family business, since there is an additional tax benefit of not paying social security taxes. However, for any case, she could earn up to the standard deduction ($5450 for 2008) and pay no federal income tax. Assuming she made the minimum wage ($5.85) for 10 hours per week, she could earn about $2737 a year after state and social security taxes. Put the entire paycheck amount in a Roth IRA. Since she has earned income, she can contribute up to the maximum of $5,000 or wages earned, whichever is less. The major benefits of a Roth IRA are that earnings grow tax free and withdrawals after 59 1/2 are tax free. Alternatively, the parents can make the contribution for the child and let them use the money they earn. Contribute for at least $ 2700 for 6 years. At 23 , her savings would be worth about $20,800 at a 10% return, which is above the amount needed for the One Year Contribution. Invest the savings in a diversified stock market index and wait 41 years. With a 10% return, the Roth IRA would be worth about $1,000,000 after that time. "Before bending the rules, one must first understand them." ~ a former boss. In general, many financial rules exist for a good reason. 20% down payments and debt to income ratios of 36% (28% for housing debt) have a good basis. People that met these guidelines were more likely to consistently meet their loan payments. In addition, these guideline provided a margin of safety for any short term financial issues a person might have. I'm not against bending these rules. In fact, I bent the rules for my first home purchase, which did make my finances tight for a couple years. However, being an engineer, I was good at the personal finance math, was able to calculate my own mortgage interest and understood the risks of bending the rules. For some, financial difficulties occurred because they didn't understand these rules that they were bending (or breaking). From what I've read, some sub-prime borrowers accepted the qualification by loan brokers as validation of their ability to meet mortgage payments. Also, the same assumption seems to happen with some credit card holders, i.e. it's OK to charge to the credit limit authorized by the issuer, even if the payments may not be affordable. While mortgage brokers and credit card issuers may be experts, I realize they work for their companies and are not necessarily looking out my interests. Thus, to protect myself, I do my own due diligence or hire someone who can do it for me. Before bending the rules, I like to understand the rules and therefore, better know the potential downside risks. For more on The Practice of Personal Finance , check back every Wednesday Thursday for a new segment. File form 4868 for an automatic six month extension to file. However, form 4868 does not extend the time to pay taxes. If one expects to owe taxes, the payment needs to be sent in by April 15, 2008, or there may be penalties and interest added. If one is expecting a refund, no payment needs to be submitted with form 4868. In addition, there is no penalty charged on a late tax return (i.e. the tax payer did not file form 4868) that has a refund. That's because penalties are only charged on the taxes owed. Intel - I expect Intel to meet their lowered guidance numbers. I believe Intel is taking market share from AMD, which disappointed last week. If Intel misses, I think the tech stocks will have a tough time in the second quarter of 2008. IBM - They raised their guidance last time. If IBM misses, it will be bad news and the market will decline. I currently expect IBM to meet expectations. Ebay - I think Ebay has become non-relevant. While Ebay is the dominant company in Internet auctions, other companies, such as Amazon.com, are chipping away at its business model and market share. If Ebay misses its expectation, I won't be too concerned. Google - This is the wild card for this week. Google does not provide guidance. On the downside, an independent third party company, comScore, has reported that Google had a slowdown in paid clicks, its main source of revenue. Google has explained the slowdown as a result of improved validation of clicks, which will eventually result in higher, not lower, revenue. Thursdays results should give an indication of who is correct. While I hope Google meets expectations, I believe there is a reasonable probably of a miss. If Google does miss, this quarter will be a challenging one for tech stocks. Net, this week could be a turning point or a continued decline for the stock market, depending on the initial tech sector result. If the news is bad for Intel, IBM and Google, economic recovery may be delayed until 2009. Disclosure: I own Google and Amazon. ** On 3/7/2008, the system gave a sell signal for AAPL and GOOG. I will try to sell AAPL in an upcoming rally. I plan to hold GOOG since it is part of my core holdings. The market appears to be re-testing the near term bottom. As of the close on 4/11/08, the Dow, Nasdaq and S&P 500 indices were respectively down 6.45%, 13.65%, and 9.83% year to date, still up from lows of 9.37%, 16.58% and 11.86% in my 3/17/08 Stock Purchase Update. I continue to believe that the probability of a recession in 2008 is relatively high, if we are not already in one. The multitude of negative factors will eventually outweigh any actions by the government and financial institutions. Originally, the Fed interest rate cuts and other actions led me to expect that the bull market would last through summer, 2008. However, the economic data in early 2008 may have caused the bull market to end earlier. For either case, I expect the market to continue to be choppy in 2008 with many short term rallies and declines. At this time, I plan to sell AAPL into the next rally and continue to hold the balance of the portfolio. I do not plan to add any more to the amounts that I have already invested in the above tables. Creating and selling the end product is energizing. Previously, I had worked over 20 years in R&D (Research and Development) design new products. While we did work with the final customer, our organization was not ultimately making the product and the final sale. We did the design work, the scientific experiments, and qualified the product for production and sale. However, I only owned a small piece of each product that was produced an sold. In my part time job, I create a final product for each client that is customized to their needs and situation. As A Modern Conundrum: When Work's Invisible, So Are Its Satisfactions by Jared Sanberg of The Wall Street Journal points out, there is great satisfaction is being 100% responsible for the final product. Working with the final user has been very satisfying. Similar to number one, my previous job was, on a daily basis, was several degrees of separation from the final user. I have found that I enjoyed interacting with 95% of the clients with whom I worked. I expect that 20% will specifically request that I do the work for them next year. Immediate broad awareness of my service. While I think I am very good at what I do, I would have had only 1% of the clients if I had done the work on my own. That's because the company has excellent brand recognition, drawing in many more clients than I could on my own. If my dream job is to be successful, it will need awareness past family and friends. The challenge will be to create awareness in a low cost and effective way. These are a few of the elements I would like to incorporate in my dream job as I create it. For me, General Electric (GE) has destroyed its reputation at a dependable performer. The company, which usually meets targets, announced earnings had fallen 6%. Investors punished the stock on Friday, sending it down 13% to $32.05, it's lowest since August, 2004. I had previously written that General Electric is one of my core long term stock holdings. While my view of GE's potential has not changed, I am now less confident that Jeff Immelt will be able to effectively implement his green strategy for the company. While I was willing to accept the under performance of the stock price, I am not as willing to accept under performance of business results. Given this result, I expect it will take four to eight quarters of meeting targets to restore investor confidence. For now, I will continue to hold GE stock, but may reconsider if GE should miss business result targets again. Five Ways Going Gray Can Pay by the Street.com provided two good ones. Major League Baseball provides discounted tickets for those 60 and older. For example, the Yankees have $5 senior tickets for those over 60. I checked our local team and they provide half price senior tickets for select games. Monarch Mountain in Colorado offers free lift tickets to those 70 and older. Over 250 free season passes and 2,000 free day passes were issued to seniors this winter. The National Parks and Federal Recreation Land Pass replaces the National Parks Pass and the Golden Age Passport. For those 62 or older, the Senior Lifetime Pass provides lifetime access to the national parks (for up to four adults) versus an $80 Annual Pass the rest of us have to buy. Most of the rest were 5-15% discounts on various items such meals, hotel rooms, car rentals and cruises. While the discounts were good, I didn't think they were substantial enough to report as a great deal. Recently, I was talking to a soon to be graduate of a Master's degree in education. She shared she no longer wanted to become a teacher. Her goal was to find a new profession that involved working with children, but she had no idea what that might be, with only a few months to graduation. I guess my age must be showing :-) When I graduated from college, my immediate goal was to get a job, one which utilized my training as an engineer. I was expected to support myself and a job, with sufficient pay, was required to do that. While I wasn't going to take a job I hated, I knew that I didn't have to love my job. In fact, I didn't know enough about most jobs to know whether I would love or hate the work. Since taking early retirement in my forties, I have been focusing on developing my dream job. A key insight has been "Doing what I love doesn't pay very much." Not yet and perhaps never:-) Fortunately, at this stage of life and stock market willing :-), we do not need to work to support our living expenses. Recently, I read an article with a similar perspective about loving one's work. Do What You Love and Starve by Marty Nemko offers a good compromise of striving for "career contentment." His advice? A job with even half of those will make you more likely to love your job than if you had pursued a longshot career. " Still have to do something you love? Make it a hobby:-) The paycheck won't depend on it and it will still be great fun. In amateur sports, youthful agility can make up for lack of skill. For example, in tennis, a player that can get to most balls and return them will often be competitive with a player that has better skill. However, as players age or the playing level increases, better skill wins more, primarily because players tend to have less differences in agility. The same is true for personal finance. In our youth, personal finance agility can compensate for lack of personal finance skills. Spend more that one makes? Get free money through account bonuses or free loans through 0% credit card transfers. Need more money to buy a house? Get an ARM (adjustable rate mortgage) and plan on a yearly raise to cover the adjustment or move before the adjustment occurs. Need more passive income? Keep moving money to the online bank with the best rates. However, just like amateur sports, agility may not get one far enough in personal finance. At some point, skill becomes more important, especially as one becomes older. To note, I value agility. Agility works, initially. The first 0% card is easy to manage. However, five cards become harder. Add to that a home mortgage, HELOCs, and multiple bank accounts. And then kids:-) At this point, agility, by itself, may not be enough. Know when it sounds too good to be true, then it is. To be financial successful long term, I believe one must develop skills at a minimum. The best, of course, is to have agility and skill. With the filing deadline for 2007 near, here's some information to get ready for 2008 tax returns. Since the IRS publishes the tax rates in the previous fall, the 2008 tax brackets, as well as amounts for standard deductions, personal exemptions and credits, are already available. The following tables can help you develop tax strategies and estimate your tax bill for 2008. If interested in additional details, you can get more information from the IRS website. The best time to plan and prepare for taxes is before the tax year is completed, especially if one has self employment or retirement income. The tax tables are among the elements that can help one get started. Check out these Carnivals for the latest articles from the blogosphere on Personal Finance and Taxes. Here is our Q1 2008 Wealth Builder Ratio update. I am disappointed with this year's results versus goals and 2007 results. 2008 has not been very kind to our financial plans and goals so far. For more details on the relevance of these ratios, please see this How Much Is Needed To Be Wealthy - The NUMBER. For the third year in a row, the returns of the stock market are on track to under perform in the first half of the year. This year's declines have caused our portfolio to lose 1.50 times my pre-retirement salary. The portfolio was down as much as 2.43 times salary when I did a mid quarter check on February 22, 2008. Fortunately, we do not yet need to sell any investments for our retirement expenses. At this point, we are staying invested in the market. 23 21.2 The significant loss is due to the stock market decline in Q1 2008. Currently, our only debt is our home mortgage. Since we retired, we have not made our usual 4% principal payment in January. We will wait for the market to recover slightly before selling some investments to cover this payment. Both #1 and #2 were directly correlated with how well our stock, bond, and CD investments did. Due to a weak first quarter in 2008, our stock, bond, and CD investments have returned -7.6%. This compares with an S&P return of -10.53% and a Dow return of -9.37% for 2008 YTD. Number 3 will be achieved once we make an additional payment equal to about 4% of our mortgage principal later in 2008. The market appears to be rebounding from near term bottom. As of the close on 4/04/08, the Dow, Nasdaq and S&P 500 indices were respectively down 4.35%, 10.61%, and 6.16% year to date, still up from lows of 9.37%, 16.58% and 11.86% in my 3/17/08 Stock Purchase Update. I continue to believe that the probability of a recession in 2008 is relatively high, if we are not already in one. The multitude of negative factors will eventually outweigh any actions by the government and financial institutions. Originally, the Fed interest rate cuts and other actions led me to expect that the bull market would last through summer, 2008. However, the economic data in early 2008 may have caused the bull market to end earlier. For either case, I expect the market to continue to be choppy in 2008 with many short term rallies and declines. At this time, I plan to sell CNH, AAPL into a near term rally and continue to hold the balance of the portfolio. I do not plan to add any more to the amounts that I have already invested in the above tables. No matter who is elected, I believe the era of low tax rates is over, perhaps even as early as 2010. Unquestionably, if the Democrats are elected, tax rates are going up to fund the numerous new social programs such as universal health care, foreign aid, education and job aid. The tax increase will affect the "rich," which can begin either at $75,000 or $250,000 depending on which candidate is elected. If the Republicans are elected, taxes will inevitably go up also. The war is expensive to fund and it appears there will be several more years before it ends. Also, the recent economic crises and social security issues will probably require additional taxes to resolve. Since 1968 , marginal top rates on taxable income have been as high as 77% and capital gains rates as high as 39.6% . While I don't think tax rates will get this high, it will be higher than the 35% and 15% maximum tax rates that are in effect now for income and capital gains respectively. For many wage earners and people receiving pensions, there is little to do but accept higher tax rates. With the exception of home mortgages, rental real estate or dependents, there is isn't much the average wage earner can do to reduce taxable income. However, for retirees with mainly non-wage earnings (e.g. dividends, interest, and capital gains) or retirement plan distributions(e.g. 401k or IRA), there may be some opportunities if one can time when the income is taxed. Make Roth IRA conversions at a 15% or lower marginal tax rate. Since 1968, the tax rate of the first bracket has ranged between 10-16%. Therefore, I am projecting that my future tax rate on retirement plan distributions will be 15% or higher. It's an easy decision to make the conversion now to enable a 0% tax on withdrawals in the future. The only downside risk is the enactment of a FairTax. Start distributions from traditional IRA earlier than 70 1/2. For those that have significant retirement account savings, the required minimum distribution (RMD), which begins at 70 1/2, may force one to take large withdrawal each year and that are nearly 100% taxable. After 59 1/2, distributions from an IRA are penalty free. I plan to use a mix of spending from principal, investment earnings, and IRAs to keep taxes on retirement distributions at a minimum. Sell stock with long term capital gains in the next 2 -3 years. In 2008 to 2010, the long term capital gains rate for stock can be as low as 0% and is a maximum of 15%. The low capital gains tax rate is due to expire in 2010. It is likely the maximum long term maximum capital gains tax rate will be higher than 15% after 2010, or even earlier. If one likes the stock, it can be immediately repurchased, at a higher cost basis. For those interested, the analysis can be done on a spreadsheet simulating a tax return using income sources and adjustments, itemized deduction and exemptions, credits, and the 2008 tax tables. Otherwise, a qualified financial planner should be able create a individualized plan based a person's own situation. There once was a hard working farmer and wife who both had never taken a day off from farming. Then they got a once in a lifetime opportunity to visit Paris. Since one needed to stay, they decided have the wife go, while her husband tended to the farm. After arriving in Paris, she called home to let her husband know she was OK.
"How is everything on the farm?" she asked. "Our cow, Missy, died," he replied. She was upset and commented, "How can you be so insensitive? Missy, was almost one of the family. Since I am so far away, you could have let me know in a gentler way." "How could I have done that?" he asked, wanting to do better next time. His wife explained, "Well, you could have prepared me for learning that she had died. On this first call, you could have told me the cow had somehow gotten up on the roof. On the next day, you could tell me that she jumped off and is limping. On the next call, you could tell me the vet needed to be called. And on the fourth call, I could find out she needed surgery. And finally, you could have said she died on the fifth call." "I guess you're right. I should have used more sensitivity in how I told you," he agreed. "Thanks for understanding. By the way, how is Mother?" she asked. The newly enlightened farmer replied, "Today, she was up on the roof ...."
Since July, 2007, it feels to me that the Fed has been like the enlightened farmer when delivering news about the economy. In July, 2007 the economy climbed up on the roof, as subprime loan risk significantly increased. In August, 2007, it slipped and was limping, requiring the first of a series of interest rate cuts. In January, 2008, the vet needed to be called, to address a liquidity crisis. In March, 2008, there was surgery; to save Bear Stearns. Now, in April 2008, is the first official mention of the possibility of recession. With respect to a recovery, Mr. Bernanke expects economy to return to growth by the second half of 2008. In other words, the possible recession will be shallow and short. At this point, I agree with the Fed's recovery position and hope they won't need to gently deliver bad news of a longer recession. As we are wrapping up our 2007 tax return, I realized we will have a new tax opportunity in 2008. The majority of our 2008 income, consisting of dividends, interest, capital gains and conversions to Roth IRAs, will not have any taxes withheld. Therefore, we need estimate our 2008 income to pay both state and federal quarterly estimated taxes for 2008. Otherwise, we may owe penalties and interest for underpayment of our 2008 tax liability. Being an engineer, I tried to estimate the optimal balance of income and tax liability for a family of three with a young child. There are three tax credits, the education credit, the child tax credit and the saver's credit, for which we could qualify in 2008, depending on income level. In addition, below certain income levels, one can qualify for a 0% long term capital gains tax rate, or conversions to Roth IRAs. This tax benefits and income limits are summarize below. Engineering - OK, I admit I'm biased since my degree is in engineering:-) However, I believe that the world will continue to need engineers of all types as developing economies expand, environmental challenges increase, and resources become more scarce. The world will need more energy, more infrastructure, more technology and more innovation to meet growing demands. Finance/Risk Management - The recent mortgage, investment bank and credit crisis may cause some to avoid this area. However, I believe the recent crises show that more education and expertise is needed to enable the future changes and innovations in financial and economic areas. Business - I would consider a degree in this area with emphasis on business innovation and entrepreneurship to be valuable in today's economy. Companies will always need business leaders who can deliver new innovation to the market. Basic science - Chemistry, biology, or physics are a few examples of science degrees. Science is one of the main drivers of innovation, enabling new inventions and technologies. I believe there will always be demand for scientific researchers, even more so at the PhD level. To note, I am not opposed to taking courses in subjects are not related to a profession. I would tell my daughter take English, Politics, History, Music and other humanities courses. They are a excellent part of rounding out one's education. However, I would recommend majoring in one of the four areas I listed. The Top 10 Degrees Drawing Massive Demand in 2008 by Everyday Finance on the top 10 majors and starting salaries. The Top 10 Jobs for the Class of 2008 at Careerbuilder.com. Top 10 Best Jobs Based upon Average Salary, Growth, Job Openings at eLearners.com. These articles provide excellent perspectives on good jobs and the degrees that can lead to them. This is not financial or higher education advice. Please consult a professional advisor. No, this is not a get rich quick scheme. It is get rich "sure" scheme, based on a simple mathematical concept, compounding. The power of compounding is one of the few guarantees in personal finance. The only risk is not living long enough to see the benefits, but in such a case, one's heirs will get the benefits:-) Unfortunately, compounding is about as interesting as watching glue dry, water boiling, or moss growing on trees. It eventually happens but there is no excitement and the process is painfully slow. Most people have probably quit reading this post by now. Why? After hearing about "compound interest, " many have already decided it's not for them, perhaps because it involves saving or too much time. I remember when a colleague presented the concept of compound interest with high school students. They became visibly disinterested once the approach was shared. For reference, I chose the interest rates of 10% and 4% because they have been demonstrated as achievable. From 1986 to 2005, the S&P 500 had a 12% return and the 10 year treasury yields have rarely been below 4% since 1962. For those that want to try different contributions levels, interest rates and time frames, use this calculator by Bankrate.com.